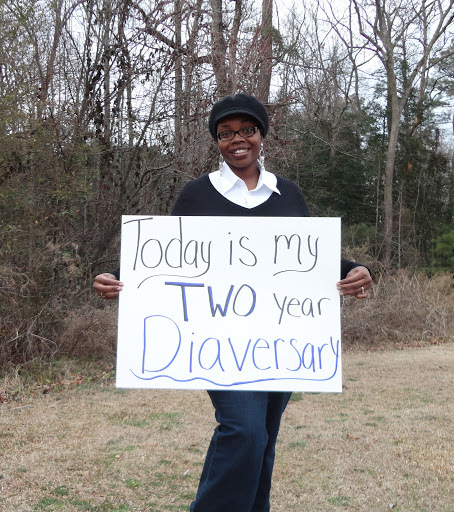 It’s been two years since I was diagnosed and I’ve been thinking about my Diaversary all month. On one hand, it seems like only yesterday that I was on the brink of diabetic coma. But on the other hand, when I think about how far I’m come with understanding this illness, two years seems about right. Diaversaries should be a time to reflect upon your progress and blessings. So, here I go. 1) Get over my terrible anxiety about having hypos. I couldn’t sleep peacefully through the night when I was first diagnosed, but I’m back to normal now. 2) Think about motherhood. I am finally able to entertain the idea of being a mom. I took motherhood completely off “the list of things I’d like to accomplish in my life” when I was diagnosed because I was so consumed with managing the illness that I had no room for anything else. Now that I can count carbs in the blink of an eye, I am ready to add motherhood back to my bucket list. (It’s a LONG term goal–not short term one). 3) Tell people I’m diabetic without fear of what they may think. I’ve accepted my status. It comes in phases and stages, but I am more vocal and less hesitant to share with others. 4) Stop fearing the worst case scenario so often. Diabetes IS serious business. For a while, I would frequently break down crying thinking about losing a limb or going blind. I’m over feeling sad about the horrors of diabetes more often than celebrating the fact that I’ve got the use and activity all my limbs. I’ve got much more walking to do with these legs and seeing to do with these eyes. So, in two years time…I think I’m on the right track. 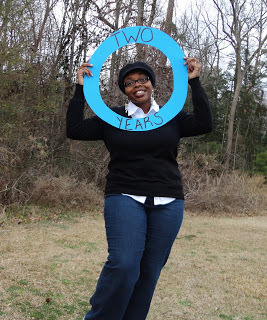 There are a few things that I need to work on, but it’s MY diaversary and I’m only gonna focus on the positive. My progression deserves to be celebrated! Congratulations on two years of really hard work, both mentally and physically! Thanks for all you do!